Alphabet books abound in every form and style. Kitty cats and plump puppies, cows and pigs romp alphabetically in some. Others, such as Dr. Seuss' On Beyond Zebra! (Classic Seuss), even take the twenty-six letters of the standard abecedarius beyond the familiar and into the creative world of fantasy. 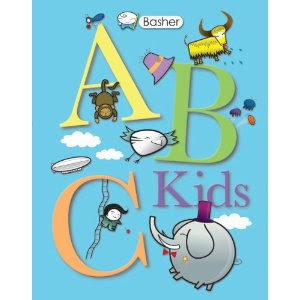 Simon Basher's new Basher: ABC Kids (Kingfisher, 2011) combines Basher's familiar pygmy clothespin-shaped people and globular critters, done up in bold colors set against pastel backgrounds, with tongue-twisting creative captions that anchor and reinforce the sounds of the featured letter and may extend the working vocabulary of early childhood education students. Basher cleverly uses the improbabilities of his captions ("Walter's worms wear white wigs") to keep kids involved as he extends the humor with his inventive illustrations. In their starred review, Booklist says "... there's more to this than just cute. The obvious care that has been put into the design, format, and word choices is what makes this [book] a delight. . . .